A quick read packed with adventure. Glittery and spiky. The plot kept me going. I wanted to know what happened and how Wil worked with her powers to turn things to gemstones. I wanted to know the fate of the kingdoms and how Loom fit into it all. I wanted to know. I wanted to get to the end. Wil was likable and readable. She could be the dainty princess or the badass, whichever she needed to be, without feeling like a Mary Sue. Loom, on the other hand, felt a bit too-too. He was too welcoming to a stranger (Wil) and too willing to pull her into his plan to save his kingdom. He felt a bit weak and two-dimensional, but I still liked him. Kay was great – she had what she wanted, she had flaws that a lot of girls do, and she didn’t let people tell her what to do. She did feel like “the mom” character, and then “the girl friend” – only stuck in there to be those people to Wil. The setting – The world in this story is fantastic. I loved the magic laced with steampunk and alchemy. There are dirigibles and goggles that tell time, solar powered stuff, and magical powers. DeStefano created a huge world in the space of this short book, with kingdoms that feel different and people with different beliefs. The writing – The writing was great, to the point, and solid, without verbiage and long winded prose. It did, however, do that thing where it would say something and then add a weird metaphor onto the end, as if he reader couldn’t understand how the sun shined on the surface of the water. Metaphors are best used when comparing two things that don’t general go together to enlightened the reader to something they may not otherwise, but that’s another post. 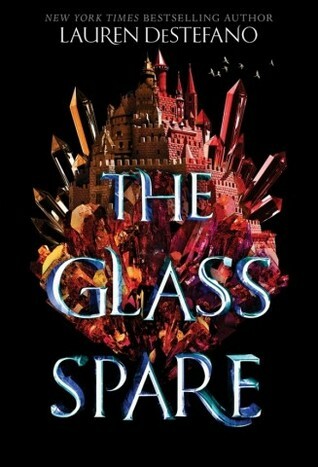 Overall – I give The Glass Spare a 4 out of 5, for it’s enticing plot, interesting characters, amazing world, and good writing. While I feel that the story and characters could have been deeper, I’ll definitely be checking out The Cursed Sea, the next book, when it hits shelves.